Yep. It’s true. We got tired of cooking boneless chicken breasts and decided to give pork chops a try. They’re relatively inexpensive – especially when they’re on sale at the grocery store – and cook up in a flash. But before you buy them, understand that not all pork chop cuts are created equal. Look for center-cut chops, about ½ to ¾ inches thick. A little thicker, and you can pound them out. Thinner, and they get good and tough – FAST – so don’t purchase them too thinly sliced. Ready for one of the easiest “un-recipes” ever? Here goes: add salt (and pepper, if that’s your thing) to each side of each pork chop. 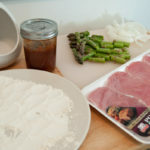 Dredge chops in flour and shake off excess. Heat vegetable oil on medium and cook about 3 or 4 minutes on one side. Flip over and shave a little Parmesan cheese on top. It can be difficult to tell when the chops are cooked just right, so don’t be afraid to stick a meat thermometer in and cook until the chop reaches 145 degrees Fahrenheit. Serve with a side of wilted spinach or another in-season leafy green veggie. 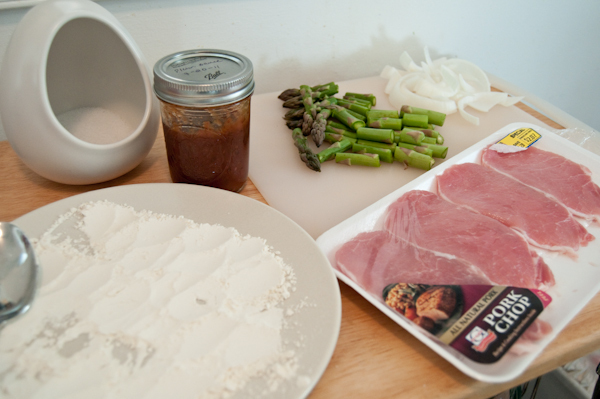 You can do what we did and serve the chops with pan-cooked onions and asparagus. It’s the bacon and sausage that give pork such a bad rep, but pork chops, along with pork tenderloin are two of the leanest cuts of pork, providing an alternative to other lean meats. What’s your favorite cut of pork? How do you prepare it?